Perfect getaway in Tahoe. Prepare a meal in the fully equipped kitchen and cozy up to the gas stove or stroll to nearby restaurants, market, and Tahoe Park HOA Beach area. Want to bring the whole family? Add Karley's Lake Lodge to your reservation! This charming cabin is close to Sunnyside and walking distance to Ward Creek. The quiet street and large level lot welcome you to the fully equipped cabin. Spend the nights enjoying the wood burning fireplace and collection of DVD's. Get here to get away! This fully equipped cottage welcomes you with a gas woodstove and open floorplan with views of the landscaped backyard. Great location walking distance to Tahoe Park HOA beach area, restaurants and markets. Close to town and skiing. Treasure in Timberland! Just the right size for a small family and fully equipped for an enjoyable vacation. Hot tub on the back deck and Ward Creek State Park just around the corner. Central location between Tahoe City and Homewood. Thompson's Landing has recently been remodeled and has everything you'll need to enjoy the most wonderful vacation in Tahoe! It boasts 3 full bedrooms, 2.5 bathrooms and is an easy stroll to the common area swimming pool (summer only) and much more! This charming 1 bedroom plus loft, 1 bathroom Old Tahoe style cabin has all the amenities you need to enjoy a perfect vacation in Tahoe. It's fully equipped with washer, dryer, dishwasher, microwave, television with cable, and WIFI internet. Single story perfection offering an open floorplan and 2 spacious bedrooms. Wood burning fireplace and an outside hot tub top the amenity list! Fully equipped and ready to make your vacation easy! This charming 2 bedroom, 1.5 bathroom 'Old Tahoe' style cabin offers a great location that is close to Tahoe City and an easy walk to the Tahoe Park HOA beach area and nearby markets and restaurants. This fully equipped cabin offers a private Hot Tub too! This remodeled cabin offers 'old Tahoe' charm and modern amenities. South facing deck faces the trees so you can enjoy the nature. Quiet street and convenient location that is close to Tahoe City and walking distance to lake. This mountain cabin is welcomes you with it's open floorplan accented by vaulted ceilings and stone fireplace. The upstairs living offers nice separation from the downstairs bedrooms. All in a quiet, yet convenient, location! 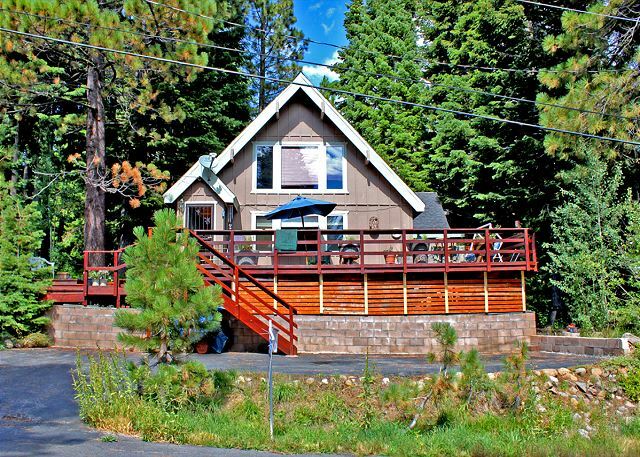 This fully equipped Tahoe cabin is located on a quiet street in Tahoe Park. Enjoy single story living in this updated and open floorplan. Sunny front deck and river rock fireplace. Plenty of parking and walking distance to private HOA beach area.